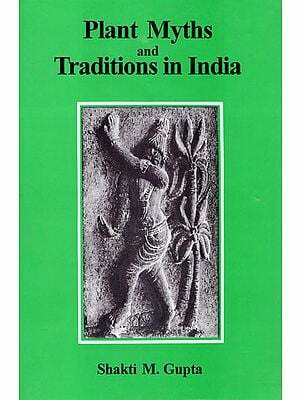 This book examines, for the first time, those threads in Indian thought that present a prolife view of plants. 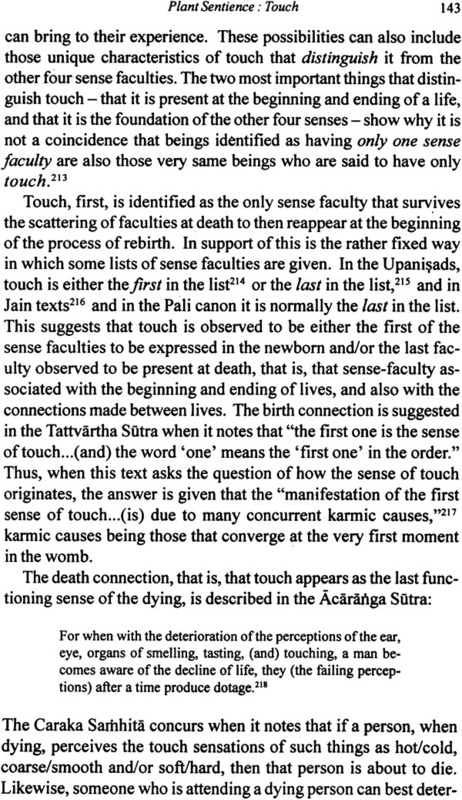 Using texts from Vedic, Hindu, Jain, and Buddhist traditions, the author argues that there is strong support in early materials that plants are thought to be alive, to be sentient (and have the one sense of touch), to feel pleasure and pain, to have an interior consciousness, and to be bearers of karma. Moreover, while plants are traditionally thought to be of tamasic quality with their immobility and dullness, they are sometimes described as sattvic, with their calmness, even – mindedness, and service to others. In fact, the author argues, plants are frequently used to provide a model for the practiced ascetic – in that they bend but don’t break with the wind, aren’t distracted when buzzed by a mosquito, and flourish in their steadfastness. 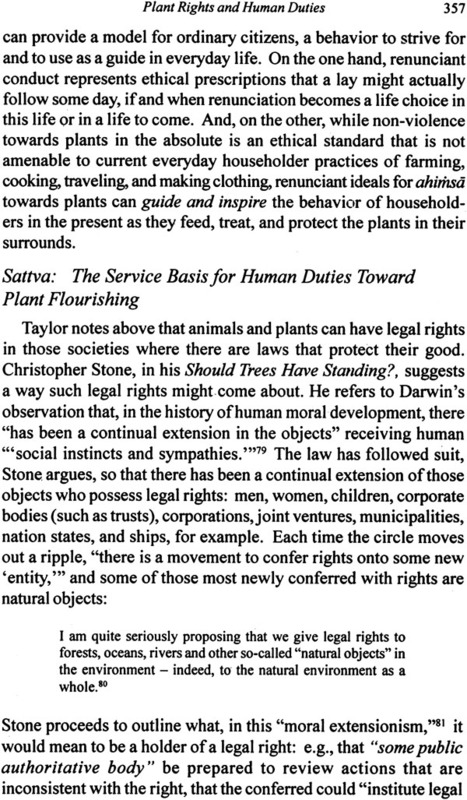 Given the theoretical discussion of plants within the range of sentient being, the book then focus on the intimate life humans have with plants. 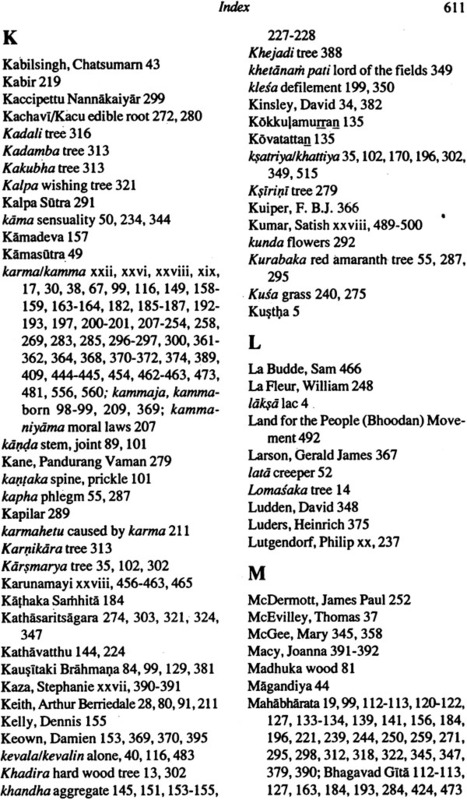 Texts devoted to botany, medicine, law, art, literature, and religion; for example, depict human conversation with trees, humans marrying trees, and humans delineating their responsibilities for the well being of plants in the greatest detail. Most difficult is the problem of eating, and in that ahimsa or non – violence towards plants would be the ideal in the extreme, vegetarianism shows up the compromise that is made once plants are brought into the sentient realm. 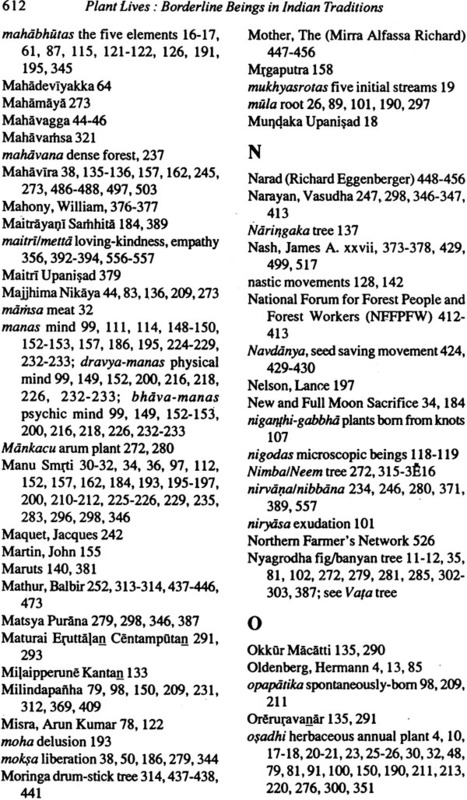 Finally, the author explores the founding premises of several current environmental leaders and movements in India that focus on plants – e.g., tree protection, tree planting, seed saving, biodiversity – to examine whether contemporary plant – oriented ecological activism in India reflects older, traditional ideas about plants. Asking whether new Hindu, Jain or Buddhist movements reflect respective older ideas, the author finds that contemporary Indian practices remain, on the whole, authentic reflection of their older roots. Ellison Banks Findly is Professor of religion and Asian studies at Trinity College. She was trained at Wellesley, Columbia, and Yale and, at Trinity, teaches courses on Hinduism, Buddhism, Jainism, Asian art, and Sanskrit. She has published widely in Vedic, Indian Buddhist, and Mughal studies, and is the author of from the courts of India: Indian Miniatures from the Worcester art Museum (1981), Nur Jahan: Empress of Mughal India (1611-1627) (Oxford, 1993) and Dana: Giving and Getting in Pali Buddhism (Motilal Banarsidass, 2003), and is co – editor of Women, Religion, and social Change (State University of New York Press, 1985) and editor of Women’s Buddhism, Buddhism’s Women (Wisdom, 2000). She is currently working on The Language of Lao –Tai Design: Religion and Textiles of the Haua Phan area, Laos. The opening of The Secret Life of Pants recounts the views of a Viennese biologist writing at the beginning of the twentieth century. Raoul France proposed the then “shocking” idea that plant move their bodies as “freely, easily, and gracefully” as humans, though much more slowly. They swing in circles, reach their tendrils out to test their surroundings, and grow into the ground as if by gravity. At the same time, they shoot up in the air as if in defiance of gravity, search for moisture during dry times, and inch toward the nearest support so as to be propped up as they grow. In short, he argued, no plant “is without movement; all growth is a series of movements; plants are constantly preoccupied with bending, turning and quivering.” Moreover, he continued, plants “are capable of intent,” and are “able to perceive and to react to what is happening in their environment at a level of sophistication far surpassing that of humans.” They have “some means of communicating with the outer world, something comparable or superior to our senses,” such that there is “some intelligence directing the plant, either from within, or from without.” These are not new ideas, he concluded, but have been around “long before the birth of Christ,” among people who had a special awareness of plants, like the Celts and “other sensitives,” and like the Hindu sages. 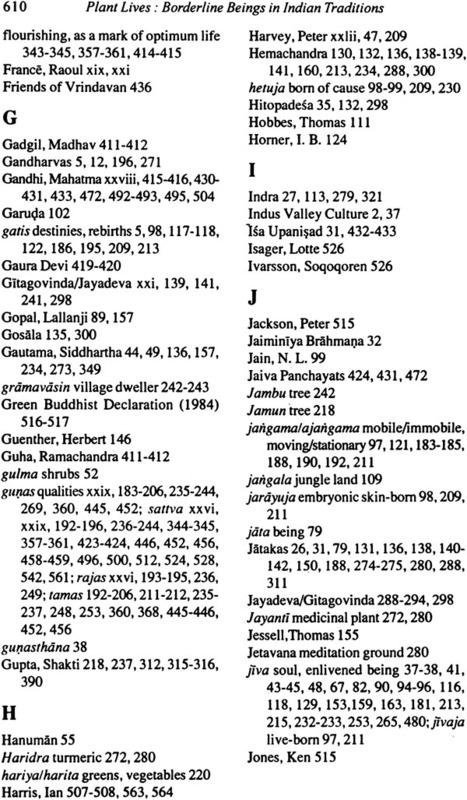 His suggestion Hindu sages was based on references to the “devas,” probably as being who inhabited plants. Little did France know then that such views about plants in India were less about the devas in the plants than about the very plants themselves. 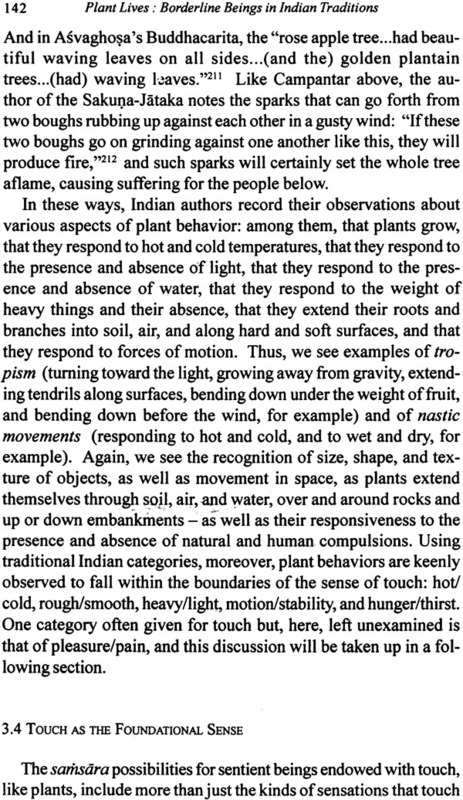 Because of their centrality in human lives, plants are often the objects of scared attention and in India, as Lutgendorf notes, trees are “cherished by sages…evocative of high emotion…(and are locations) of transcendence. 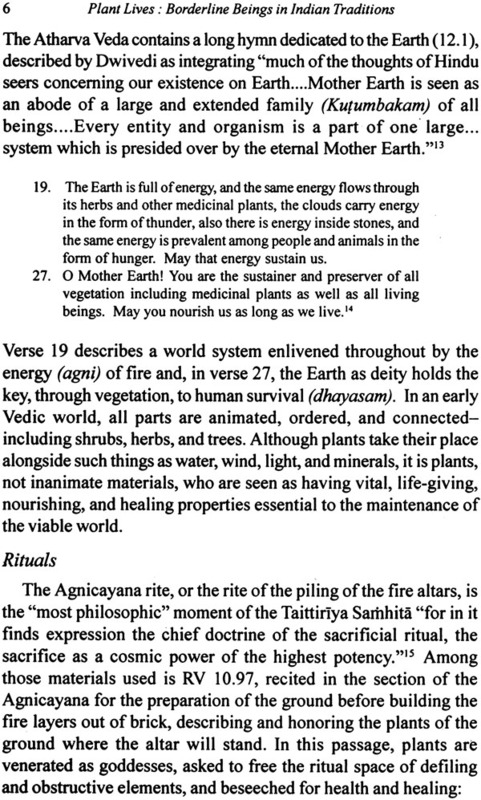 In this way plants come to play important roles in religious practice, as fuel for the sacred fire, as wood for ritual implements, and as food for priests and gods. 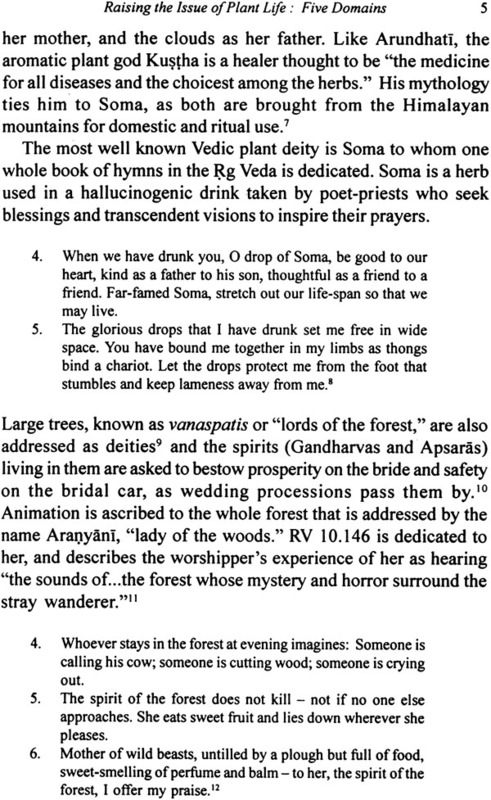 They are also the objects of worship themselves, as in the Vrksotsava or Hindu tree festival where the decoration and veneration of the tree, separate from any deity residing in it, is thought to save petitioners from hell. With plants as central resource in the survival of human life, a common presence in the religious practice of devotees, and a consistent and intimate part of every day experience – that is, with the profligate proximity of plants in so much of Indian culture –we ask whether the human intimates of plants ever wonder about the biological and philosophical status of these vegetal things that share so much of their lives. 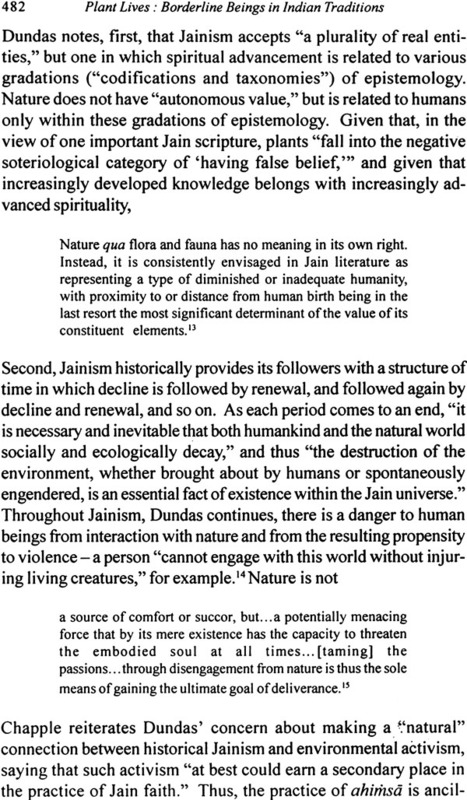 In other words, what do the Hindu, Jain, and Buddhist traditions of India understand about the nature and place of plants in the larger scheme of meaning that they, as humans, project onto their experience? 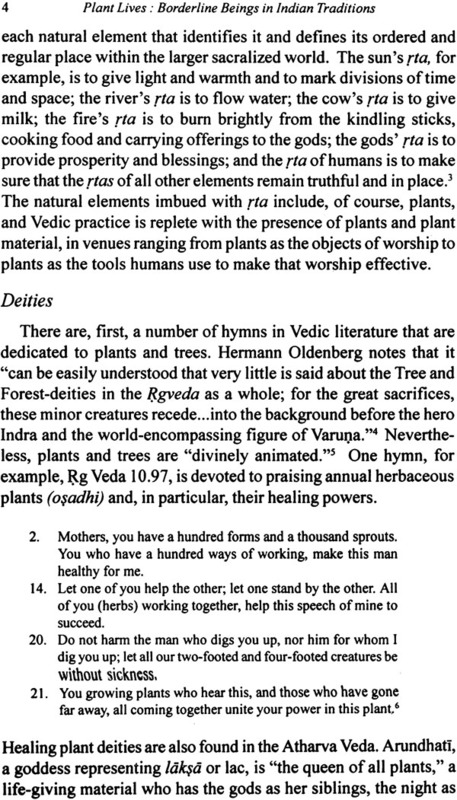 When France mentioned the Hindu sages’ awareness of plants, was he hinting at something more than just the belief that local deities were thought to live in trees? Since we must begin somewhere, and since we are interested in common threads about plants in all three of the traditions of Hinduism, Jainism, and Buddhism, we will begin in the middle of a discussion about Buddhism, we will begin in the middle of a discussion about Buddhist environmentalism as cast by Donald Swearer. 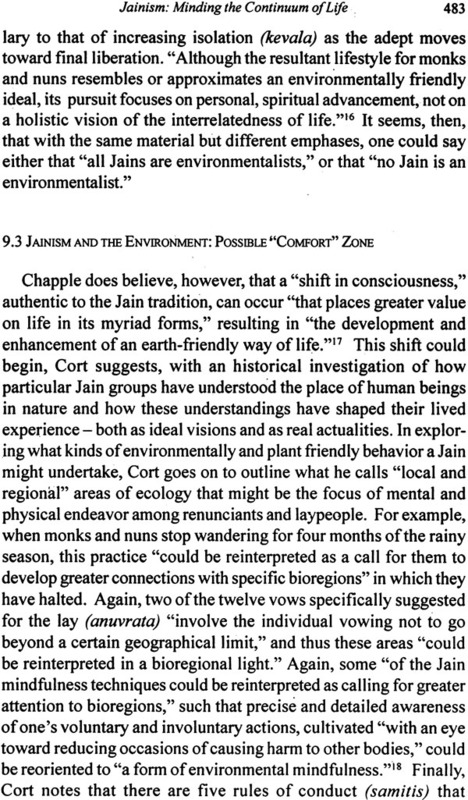 He notes: “Out of a concern for the total living environment, Buddhist environmentalists extend loving – Kindness and compassion beyond people and animals to include plants and the earth itself.” This understanding – that connection among all the parts of our experience is interdependent, holistic, and even sacred – is shared by many strands of Indian traditions, and is corroborated amply in texts ancient, medieval, and modern. 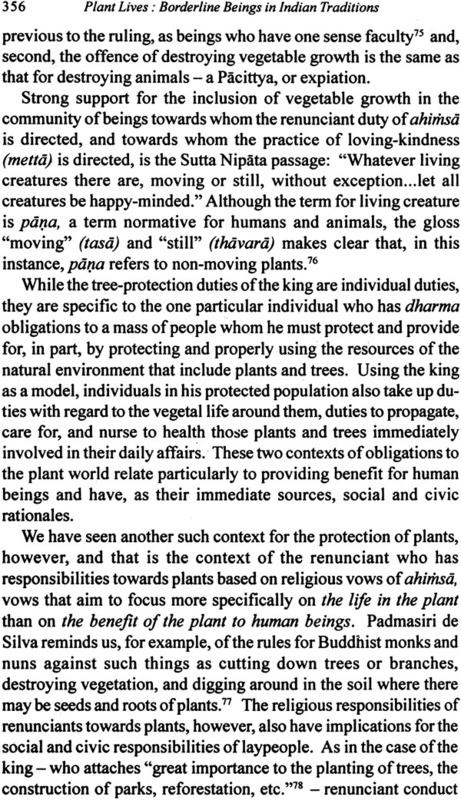 We choose this statement from a discussion about Buddhism because it is in the early Pali Buddhist attempt to situate plants somewhere suitable in the human world where the problem of plants is most clearly expressed. 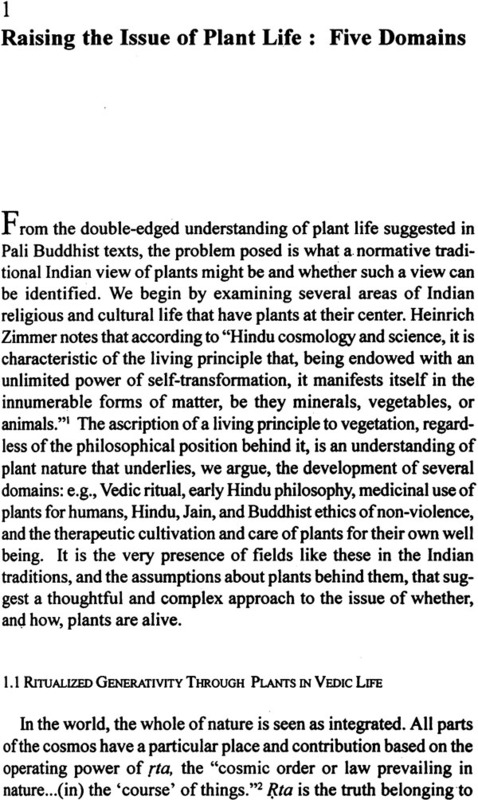 Lambert Schmithausens foundational work helps immensely in the untangling of early Buddhist views on plants. 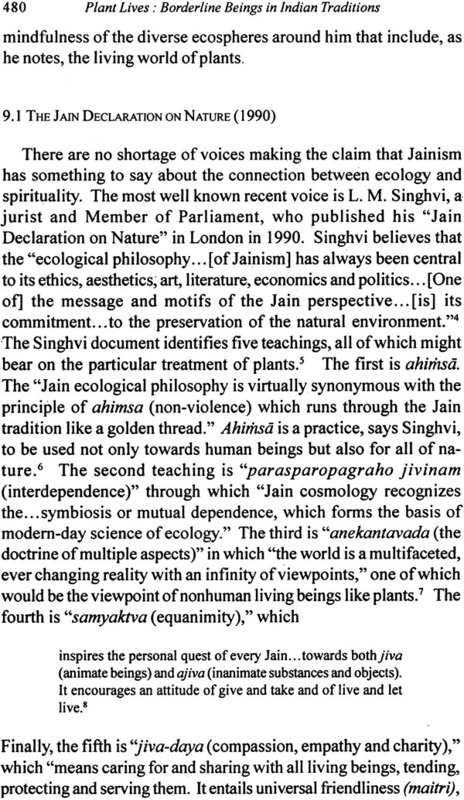 His central focus is an analysis of whether plants are considered to be living and sentient beings, and this issue is brought to the fore by Pali teachings on non – violence, where plants are none of the clear objects of the ethics of ahimsa. 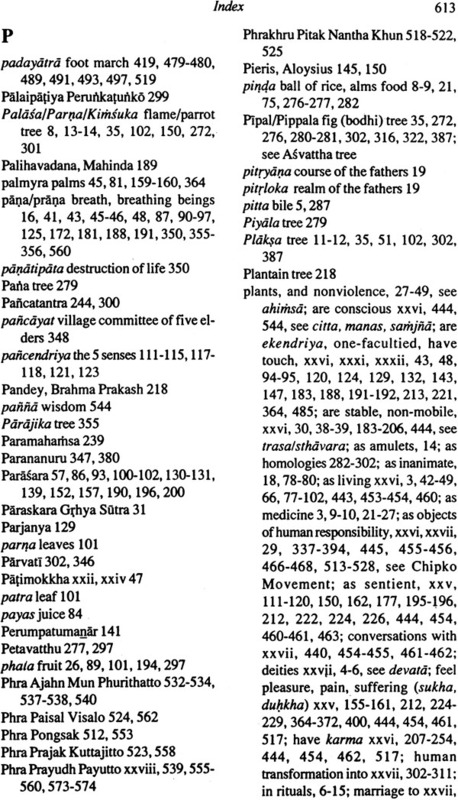 In discussions of the Patimokkha, for example, the Vinaya prohibits monks and nuns from cutting down trees (rukkha) in the course of repairing their lodgings, from cutting palmyra leaves off palms to wear as shoes, and from walking amongst alms donors during the rainy season because, in doing any of these things, renunciants will injure one – facultied living beings, i.e., plants. The reason for the discrepancy between the early and later Pali treatments of plants, argues Schmithausen, is due more to prevailing views in society at different times than to changing notions among the renunciants themselves. The code of non – violence as developed in early Buddhism, he argues, “is not concerned with spiritual practice nor even with morality proper (though some of the precepts do coincide with morality had to behave in society. 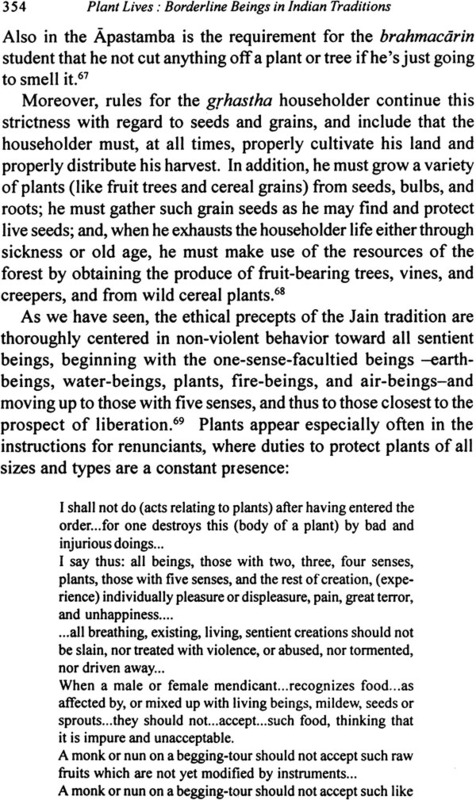 He notes that many local householders of the early period still retain their old Vedic and pre – Vedic beliefs that plants are sentient beings and, although they themselves cannot fully practice an impractical daily standard of full ahimsa, especially with regard to plants, they think it unfit for ascetics of the time to practice anything but ahimsa towards plants. 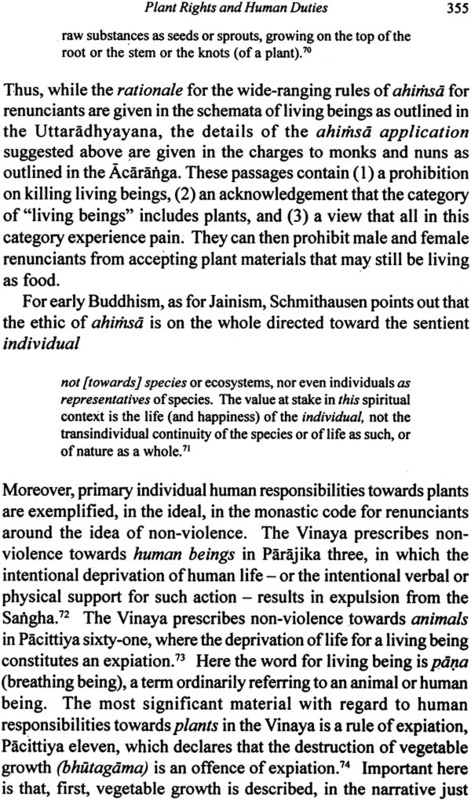 Thus, the Patimokkha proscription on killing plants is not “an element of moral, or ethically motivated, conduct in the strict sense but…rather a matter of ascetic decorum.” Or as Paul Harvey notes, “motive of the (Buddhist) rule seems o be to avoid offending popular sensibilities.” And, although Schmithausen doesn’t make much of the significance of not wanting to run roughshod over householder sentiments, I’ve argued elsewhere that a clear reason for not wanting to irritate householders and for wanting to generate their good will is precisely because these same householders are the sources of the Sangha’s material support – that is, they are donors to the early Buddhist community. Moreover, these householders are known for openly expressing any critical views of monastic behavior and for nothing when alms seekers don’t fit pre – existing views about ascetic behavior. Such a encounter often results in complaints made to the Buddha, and in the Buddha’s ruling on the donors’ behalf. 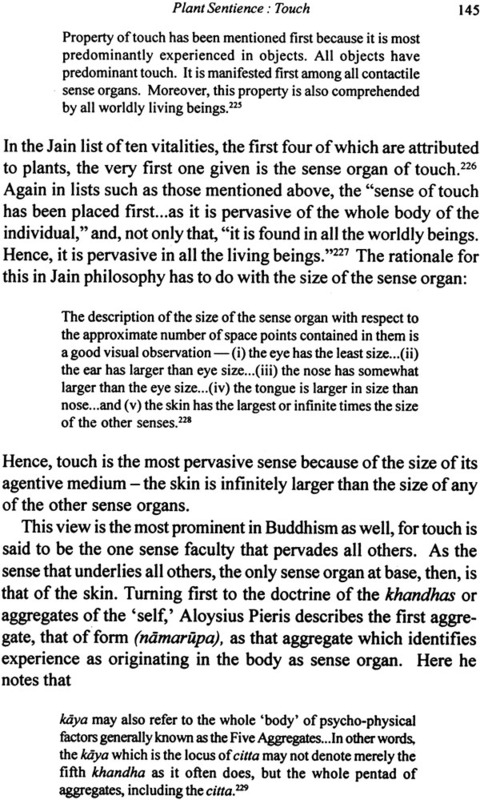 Positing such an early belief by the renunciants themselves in the living and sentient nature of plants, then, makes the ensuring developments even more striking, for Schmithausen goes on to describe a second trend in which Buddhism, as it evolves, narrows down the range of living, sentient beings who are the object of he ethic of non – violence – resulting in the considerable weakening of the prohibition against harming plants. 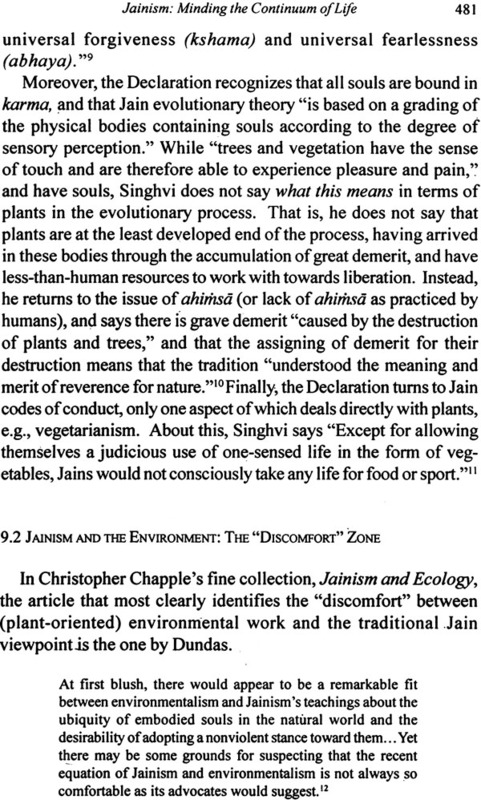 Thus, the offense involved in killing or injuring plants gets less and less, so that at some point, “ahimsa towards plants” becomes an obsolete practice if not also an obsolete view. 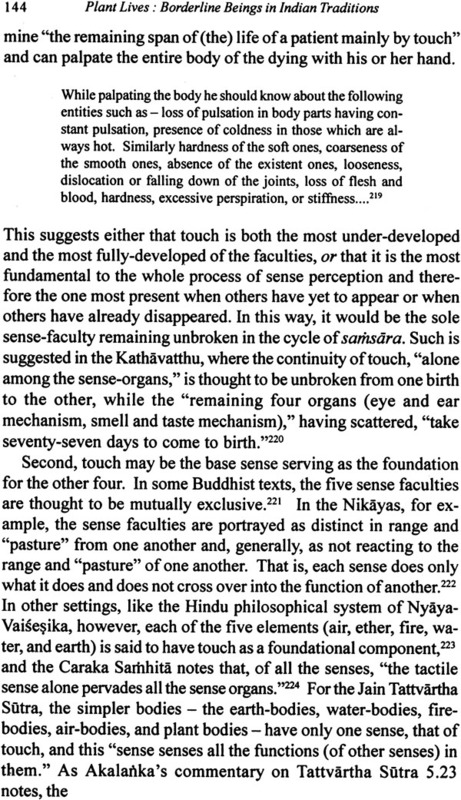 Because, however, the “shifting emphasis from the ahimsa aspect towards matters of ascetic decorum” is already evident in the discussion of the Patimokkha rule, the eventual standard exclusion of plants from the ahimsa rule becomes easily explained. Under rulers like King Asoka, Buddhism increasingly embraces laicizing tendencies and encourages lay practice in areas particularly of donation and non – violence. For the lay to practice Buddhist ahimsa, however, the objects of the non – violent ethic have to exclude plants, as lay lives would be impossible without recourse to organic, i.e., vegetable, materials for food, clothing, lodging, and vehicles. Thus, unlike some of the stricter ethical prescriptions available in this general period, Buddhist practice of non – violence is influenced by renunciant desire to please donors – early on, by practicing ahimsa towards plants themselves and, later on, by declaring plants to be non –living and thus excluded from the protections of ahimsa. This later situation allows donors to practice non – violence themselves and at the same time to freely use plants and plant products in their own daily lives.